Kurt Vonnegut is acknowledged as a major voice in American literature and applauded for his subtle criticisms and sharp portrayal of modern society. Kurt Vonnegut Jr. was born on November 11, 1922, in Indianapolis, Indiana, the son of a successful architect, Kurt Sr., and his wife, Edith Sophia. Vonnegut was raised along with his sister, Alice, and brother Bernard (whom he spoke of frequently in his works). Fourth-generation Germans, the children were never exposed to their heritage because of the anti-German attitudes that had spread throughout the United States after World War I (1914–18; a war in which many European countries, some Middle Eastern nations, Russia, and the United States fought against Germany, Austria-Hungary, and Turkey). Because of the Great Depression (the severe economic downturn in the 1930s), the Vonneguts lost most of their wealth and the household was never the same. Vonnegut's father fell into severe depression and his mother died after overdosing on sleeping pills the night before Mother's Day. This attainment and loss of the "American Dream" would become the theme of many of Vonnegut's writings. After attending Cornell University, where he majored in chemistry and biology, he enlisted in the United States Army, serving in the World War II (1939–45; a war fought between the Axis powers: Germany, Italy, and Japan—and the Allies: England, France, the Soviet Union, and the United States). This would set the stage for another crucial element for his writings when he was taken prisoner by the German army. Following the war, Vonnegut studied anthropology at the University of Chicago and later moved to Schenectady, New York, to work as a publicist for the General Electric Corporation. During this period, he also began submitting short stories to various journals, and in 1951, he resigned his position at General Electric to devote his time solely to writing. 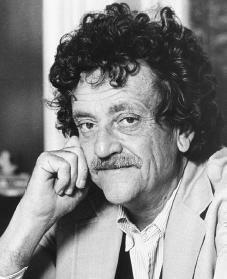 Vonnegut published several novels throughout the 1950s and 1960s, beginning with Player Piano in 1952. Player Piano depicts a fictional city called Ilium in which the people have given control of their lives to a computer humorously named EPICAC, after a substance that causes vomiting. The Sirens of Titan (1959) takes place on several different planets, including a thoroughly militarized Mars, where the inhabitants are electronically controlled. The fantastic settings of these works serve primarily as a metaphor (comparison) for modern society, which Vonnegut views as absurd to the point of being surreal (irrational; dreamlike), and as a backdrop for Vonnegut's central focus: the hapless human beings who inhabit these bizarre worlds and struggle with both their environments and themselves. works. The novel recounts the discovery of a form of ice, called ice-nine, which is solid at a much lower temperature than normal ice and is capable of solidifying all water on Earth. Ice-nine serves as a symbol of the enormous destructive potential of technology, particularly when developed or used without regard for the welfare of humanity. Vonnegut's reputation was greatly enhanced in 1969 with the publication of Slaughterhouse-Five, an antiwar novel that appeared during the peak of protest against American involvement in the Vietnam War (1955–75; when American forces aided South Vietnam in their fight against North Vietnam). Vonnegut described Slaughterhouse-Five as a novel he was compelled to write, since it is based on one of the most extraordinary and significant events of his life. During World War II when he was a prisoner of the German Army, Vonnegut witnessed the Allied bombing of Dresden, Germany, which destroyed the city and killed more than one hundred thirty-five thousand people. One of the few to survive, Vonnegut was ordered by his captors to aid in the grisly task of digging bodies from the rubble and destroying them in huge bonfires. Because the city of Dresden had little military value, its destruction went nearly unnoticed in the press. Slaughterhouse-Five is Vonnegut's attempt to both document and criticize this event. Like Vonnegut, the main character of Slaughterhouse-Five, named Billy Pilgrim, was present at the bombing of Dresden and has been deeply affected by the experience. His feelings develop into spiritual uncertainty that results in a nervous breakdown. In addition, he suffers from a peculiar condition, of being "unstuck in time," meaning that he randomly experiences events from his past, present, and future. The novel is therefore a complex, nonchronological (in no order of time) narrative in which images of suffering and loss prevail. After the publication of Slaughterhouse-Five, Vonnegut entered a period of depression during which he vowed, at one point, never to write another novel. He concentrated, instead, on lecturing, teaching, and finishing a play, Happy Birthday, Wanda June, that he had begun several years earlier. The play, which ran Off-Broadway from October 1970 to March 1971, received mixed reviews. There were several factors which could be interpreted as the cause of Vonnegut's period of depression, including, as he admitted, the approach of his fiftieth birthday and the fact that his children had begun to leave home. Many critics believe that, having at last come to terms with Dresden, he lost the major inspiration for much of his work; others feel that Slaughterhouse-Five may have been the single great novel that Vonnegut was capable of writing. Whatever the cause, Breakfast of Champions marked the end of his depression and a return to the novel. In Breakfast of Champions, as in most of Vonnegut's work, there are very clear autobiographical tendencies. In this novel however, the author seems to be even more wrapped up in his characters than usual. He appears as Philboyd Sludge, the writer of the book, which stars Dwayne Hoover, a Pontiac dealer (Vonnegut once ran a Saab dealership) who goes berserk after reading a novel by Kilgore Trout, who also represents Vonnegut. Toward the end of the book, Vonnegut arranges a meeting between himself and Trout, whom Robert Merrill calls his "most famous creation," in which he casts the character loose forever; by this time the previously unsuccessful Trout has become rich and famous and is finally able to stand on his own. Breakfast of Champions and Slapstick, or Lonesome No More (1976) both examine the widespread feelings of despair and loneliness that result from the loss of traditional culture in the United States; Jailbird (1979) recounts the story of a fictitious participant in the Watergate scandal of the Richard Nixon (1913–1994) administration, a scandal which ultimately led to the resignation of the president; Galapagos (1985) predicts the consequences of environmental pollution; and Hocus-Pocus; or, What's the Hurry, Son? (1990) deals with the implications and aftermath of the war in Vietnam. In the 1990s, he also published Fates Worse Than Death (1991) and Timequake (1997). Before its release Vonnegut noted that Timequake would be his last novel. Although many of these works are highly regarded, critics frequently argue that in his later works Vonnegut tends to reiterate themes presented more compellingly in earlier works. Nevertheless, Vonnegut remains one of the most-loved American writers. Kurt Vonnegut Jr. is currently teaching advanced writing classes at Smith College, and in November of 2000, he was named the State Author of New York. Bloom, Harold, ed. Kurt Vonnegut. Philadelphia: Chelsea House, 2000. Marvin, Thomas F. Kurt Vonnegut: A Critical Companion. Westport, CT: Greenwood Press, 2002. Morse, Donald E. Kurt Vonnegut. San Bernardino, CA: Borgo Press, 1992. Vonnegut, Kurt. Fates Worse Than Death: An Autobiographical Collage of the 1980s. New York: G. P. Putnam's Sons, 1991. Vonnegut, Kurt. Palm Sunday: An Autobiographical Collage. New York: Delacorte Press, 1981. It's hard to imagine what he must have seen in WWII. Additionally, the concept this article misses elucidating fully, which may actually have been intentionally to protect son's privacy, is the complexity of attributing cause to any mental illness (acute, "momentary", or chronic, long term, ever present)... Moreover, his son apparently had a "break down" at about this same time.